Our TEC industrial / heavy duty range of glue guns can dispense TECBOND low melt and hot melt glue sticks which are easy to use, non-toxic, and can be applied to a broad range of surfaces. Once applied to a surface they bond instantly and can be continuously applied by adding another glue stick before the first ones run out. Glue which has not been used up when the work is complete can be left in the glue gun to be reheated and re-used when needed. 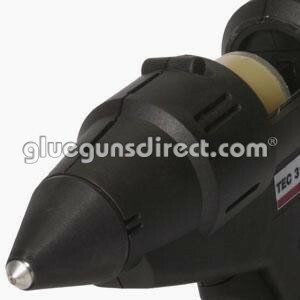 TEC heavy duty glue guns benefit from 30 years of TEC experience which ensures the utmost build quality and ease of use. A heavy duty glue gun can dispense both low melt and hot melt glue which are easy to handle, non-toxic, and can be applied to surfaces to create an instant bond. Any glue left over when the work is done can be reheated and re-used, meaning that nothing goes to waste. In a nutshell: High output glue gun ideal for production use, heavy duty, efficient, powerful, robust and cost effective. Economy grade of the Tec 3200. Does not have a Auto Standby and must be turned off if not use for 30 minutes or more. Have an old or broken glue gun, exchange it for a new Tec glue with a 12 month warranty at a discounted price. In a nutshell:High output glue gun, technology at its best! Efficient, robust, cost effective production glue gun, optional temperature modules. This tool has stood the tests of time! In a nutshell:Very high output air assisted glue gun, rugged and reliable production glue gun, exception value for money. Fast warm up exceptional melt rate powered by a 500 watt heater. In a nutshell: Probably one of the world’s most powerful hand held glue guns, this is a serious alternative to expensive bulk tank systems. Powered by 2x 500 watt heaters, this is a serious glue applicator! 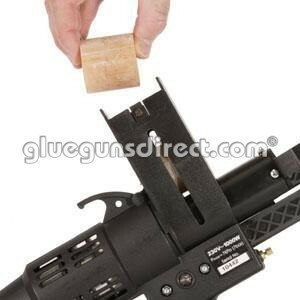 Only use specified Tecbond 43mm glue slugs / cartridges within the Tec 43mm glue gun range.